The draft is, finally, less than two weeks away, and things are starting to come into focus. Well, at least somewhat. Teams are deep into their predraft meetings, pouring over each position group as they set the boards for the final time. (Well, final time unless one night the owner and general manager or coach decide that they prefer a particular player over another, in which case things have a mysterious way of moving around.) But by and large, that process is going on with all 32 teams, before executives come up for air the Monday of the draft and start talking trade in earnest. As many of you probably know by now, I don’t partake in mock draft madness until the morning of the first round, when I will begrudgingly publish one. But I will take a few different cracks at sizing up the draft from a numerical standpoint. And today’s exercise will take a positional look at that first round and how it might play out. Specifically, this will set an over/under on my projections for the number of players selected at each position group. As you might expect, it is very heavy on the defensive line/edge guys, and a little light on the dudes who are about to start catching balls for a living, and the dudes who will be employed to cover them. That’s not the strength of this draft, and there will surely be a run on receivers and corners between, say, picks 25-50, but there aren’t too many of them who you would hear scouts absolutely, positively guarantee are going hear their name called in the first 32 picks. Ultimately, the value associated with taking a QB in the late first round — and getting that fifth-year option on them — will probably lead to a seeing four come off the board in Round 1. Kyler Murray (Oklahoma) is going first overall to Arizona, and Drew Lock (Missouri) and Dwayne Haskins (Ohio State) will end up going somewhere in the first half of the first round. Would I be shocked if Daniel Jones (Duke) was gone by pick 17 to the Giants, depending on how the board falls? Nope. But I could also project several scenarios where he isn’t selected in the first round at all. Yes, two could end up being selected. Wouldn’t be a shock — but I also wouldn’t bet on it. Josh Jacobs (Alabama) is best of the breed, and he is too clean with too much value there not to go on Day 1. After that, things get murky. There are several impact players at this position group, but teams generally want to do their RB business on Friday. Beauty is in the eye of the beholder here, big time. Good luck getting anybody to agree on who the top three are, let alone the top five or six. I could certainly envision some scenarios where only one is selected in the top 32 picks, and then a slew come off the board quickly on Friday. Marquise Brown (Oklahoma) is the guy I’d put money on going in the top 32, and a few peers like D.K. Metcalf (Mississippi), Hakeem Butler (Iowa State) or N’Keal Harry (Arizona State) could join him. I just wouldn’t bank on which one in which spot. The Big Three are fairly obvious here, and that’s probably where the music stops for tight ends in the first round. The two Iowa prospects, Noah Fant and T.J. Hockenson, have legit top-10 buzz, and Irv Smith (Alabama) is very highly regarded as well. History tells us this is a position that teams go to early, especially in the back end of the first round. This isn’t the sexiest group of tackles by a long shot, but there appears to be good value in the interior spots. I wouldn’t be surprised if six or more of them go from the likes of: Jawaan Taylor (Florida), Jonah Williams (Alabama), Andre Dillard (Washington State), Cody Ford (Oklahoma), Garrett Bradbury (NC State), Erik McCoy (Texas A&M), Greg Little (Mississippi), and Dalton Risner (Kansas State). Ultimately, it may be a half dozen or more, but I’d set the bar here. 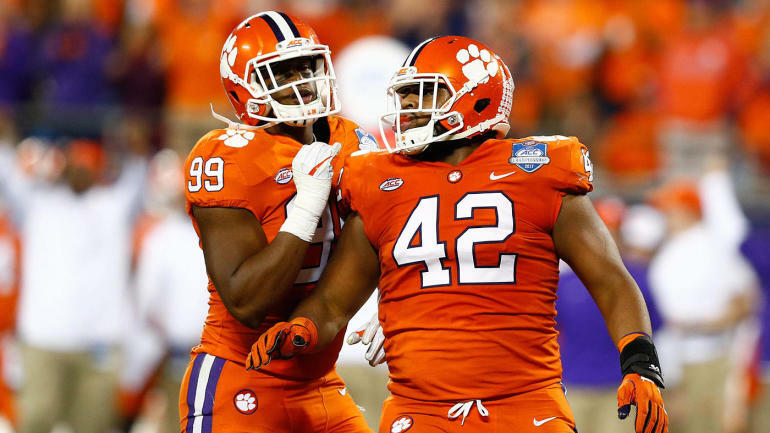 I have a hard time scribbling out mock-draft scenarios that don’t involve at least these five tackles going: Ed Oliver (Houston), Quinnen Williams (Alabama), Christian Wilkins (Clemson), Dexter Lawrence (Clemson), and Jeffery Simmons (Miss State). And there are at least a couple of others you could make the case for. This is another spot that is very much as cut and dry as it seems. There are two studs, and both are going in the first half of the first round, most likely — Devin White (LSU) and Devin Bush (Michigan). This is like the receiver group, as assessments are all over the place, which much debate on how these careers will play out. At least a couple would seemingly have to go in the top 32, but I’d have a hard time projecting the order right now. Greedy Williams (LSU), Byron Murphy (Washington), Deandre Baker (Georgia) and Rock Ya-Sin (Temple) are the corners I hear the most buzz about, and maybe they all end up going Day 1. But, again, I can’t bank on it, and neither can most GMs. I almost set this at zero, because I have a hard time telling you which kid a team would absolutely select in the first 32 picks. Maybe it’s Taylor Rapp (Washington), Deionte Thompson (Alabama) or Chauncey Gardner-Johnson (Florida) if you are looking for more of a box safety. But I do continue to hear that Darnell Savage (Maryland) is rising up boards.